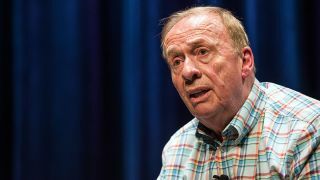 Geoff Emerick, the audio engineer who worked on many of The Beatles’ most famous albums, has died at the age of 72 following a heart attack. He was present at the band’s first recording for EMI in 1962, and was awarded Grammys for the engineering of both Sgt Pepper’s Lonely Hearts Club Band and Abbey Road. Emerick’s first Beatles album as chief engineer was the classic Revolver, and he was also involved in the White Album. However, he left while that LP was being recorded, telling MusicRadar in 2014: "The group was disintegrating before my eyes. It was ugly, like watching a divorce between four people. After a while, I had to get out." He was convinced to return for Abbey Road, though, and was pleased to have done so. “I'm glad I came back for the final bow,” he told us. “To have missed being a part of the Abbey Road album, I'd still be kicking myself." Emerick was considered a studio innovator, pioneering several recording techniques that are still in use today. He continued to work with Paul McCartney following the break-up of The Beatles, and also on albums by the likes of Elvis Costello, Jeff Beck, Supertramp and Ultravox.